Tuesday was my quarterly cancer check-up, and we had decided some weeks prior to celebrate the occasion with fried chicken and champagne, a special gift bottle from Sue, a lovely lady and friend at the gym. Fried chicken has become a rare and special meal for me, given the low regard that fried foods must hold in my nutritional pyramid. And champagne because – well, it’s still thee beverage for a Special Occasion. Test results indicating ‘no evidence of disease’ (NED) would warrant a celebration of two years with no evidence of disease. Test results reporting a recurrence of cancer would still prompt an appreciation for the 21 months that I was cancer-free. Either way, NED or no, Sue’s champagne and the Colonel’s chicken would speak to us on a milestone day. Odd, yes, but not all of life’s choices are even. So that’s what we did, we savored our fried chicken and hoisted our glasses of champagne. But what, exactly, did we celebrate? As I’ve written, PSA test results tell me how I’m doing in my contest with cancer, and PSA levels of less than 0.03 are considered ‘undetectable’ – no evidence of disease. Higher than 0.03 is a pisser, as I experienced with my first recurrence of cancer from mid-2010 to mid-2011. So what to make of test results that come back at exactly 0.03? For that’s what the number was last Tuesday: 0.03. Call it barely detectable or call it essentially undetectable. Either way, I confess to having the mean reds over this outcome. I had hoped – Oh, how I had hoped! – to be no evidence of disease: to be two years’ NED as I approach the seventh anniversary of my diagnosis, that would have been huge to me. Still, I can’t call it ‘bad’ news, because it certainly could have been (much) worse. ‘Borderline’ thus seems to me to be the appropriate label, the descriptor that, for now, best applies. Not really good, not really bad; neither here nor there but on the border between. So we’ll check me again in July to see what’s more, and then we’ll proceed as necessary. I am new to following your blog and am in the same state, stage 4, but seem to have the “free range” thing going. I am very glad for your successes and hope I may join you soon. To me, it seems some of the secondary ailments (blood clots, fatigue, etc.) are worse than the cancer. I just had scans this week following the latest in three years of chemo (results pending). It was interesting to read that you are no longer doing the hormone treatments. Enjoy your celebration meal. As a wine professional, I wondered how you knew that fried chicken is the best pairing for Champagne, but then I remembered you’re a cultured guy. I read your .03 as fabulous news, but that comes from a guy whose number has been floating between 0.30 and 0.60 for two-plus years. It would be nice if the information about this cancer were intelligible. I’m told that nothing will be done unless my PSA hits 2.0–at which time, we’d be talking further treatment. I’m of course hoping it never happens but if it does, I’m hoping better treatment will be on the boards by then, better than hormones at least. I miss Dan’s informative NY Minute blog. Sorry to hear about your news Greg. Remember this: in the continuum, it ain’t over until it’s over–so keep living every day one at a time. Congratulations, Mr. Curry! One step closer to undetectable! Sending lots of love. I HATE prostate cancer, I HATE your PSA results but I LOVE LOVE LOVE your amazing spirit and your ever battling attitude. I wonder sometimes if, for the interim of ‘no changes to treatment’ we would be better not knowing PSA results. There are a lot of things in my life I would be better off not knowing and it takes so much energy away trying to compartmentalize these ‘things’ and hide them deep into my psyche where they do not impact me negatively. I will keep you in my prayers. God is good. Bill-I’m with you-keep on keeping on! Veuve has been good luck for us during this last year, so glad you’re celebrating with that and good ol’ fried chicken! Bill, so glad you are celebrating!!! Wonderful news. It seems like good news to me and I am happy for you! Hope to see you soon! Keep Celebrating, Bill. Every new day is a Gift. 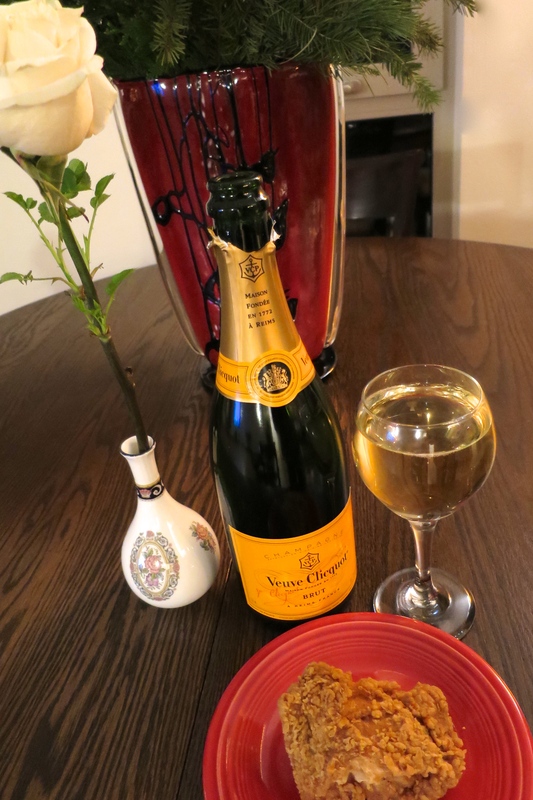 My favorite champagne and I do so love that fried chicken. Bill, I believe as you do that lets just celebrate it all. We have known the deep struggle and the ecstasy of those great reports, but more importantly we are still here. Nothing can break our spirit and that spirit is what keeps us moving forward. We move forward to enjoy all that life has to offer. No one is promised forever, all we can do is celebrate today. You are an inspiration to me. I feel we will be speaking at SCCA for a long time to come and that is just perfect for me. Some go to Tiffany’s, you go to the Colonel. OK, Bill, as long as you keep celebrating this precious life. Hope to see you & Becky next month. SO SO glad to hear, Bill! Cheering you on!!!! Thanks for the update.